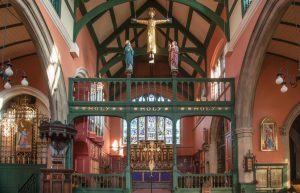 A new exhibition commemorating servicemen from the parish of St Michael & All Angels Bedford Park who died in World War 1 has opened in the church. Those remembered in the exhibition include Commander Walter Sterndale Bennett, RNVR, DSO and Bar, who died of his wounds 100 years ago this week, on November 7th in 1917. His great-nephew Dr Gareth Jones attended our Choral Requiem Mass on Remembrance Sunday November 12th, which was followed by a procession to the war memorial outside the Parish Hall. 37 of the 128 servicemen named on the parish war memorials fell in 1917. Ten of their stories are being told on large panels in the church, including photographs of the men and their homes and images of medals, gravestones, maps, a 1917 timeline, letters of condolence and other documents. It’s the fourth annual World War 1 exhibition at St Michael & All Angels, researched and compiled by one of our congregation, David Beresford. Watch David’s interview on Chiswickbuzz.net. 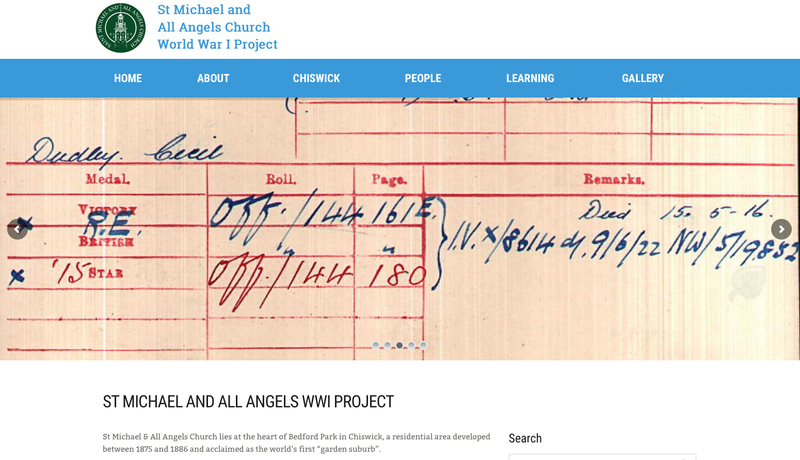 The stories are also now told on a new website devoted to the St Michael & All Angels Church World War I Project, funded by a grant from the Heritage Lottery Fund. There are lesson plans to help teachers use the stories and documents in class. Local schools have been invited to visit the church to see the exhibition and parish war memorials. Another whose life is being commemorated is Lieutenant Arthur Nixon of the Royal Flying Corps who was killed a month after his wedding at St Michael & All Angels. Lieutenant Nixon was married to Dulcie Doubleday at St Michael and All Angels Church on April 28th 1917 by the vicar, Father Jacob Cartmel-Robinson. He was killed on May 31st. The exhibition includes images of a commemorative scroll and the condolence letter from Capt. WH Davies, Chaplain to the 4th Battalion, Canadian Royal Rifles, which describes the circumstances of his death in air action above Vimy. You can also see them on this page of the website. The exhibition also focuses attention on the Parish War Memorial in St Michael & All Angels – the dramatic rood screen featuring the Crucifixion, which dominates the church (see picture right). The churches in Chiswick have been commemorating the centenary of World War 1 every year since 2014. Last month saw the fourth annual Peace In War event, organized by Churches in Chiswick for Justice & Peace (CCJP). Another lottery-funded remembrance project, “Heroes of Chiswick”, is organized by St Michael’s Church Elmwood Road W4, commemorating the 33 remembered on that church’s war memorial.